Mr. Johnny Santoso got his Diplom-Ingenieur (Dipl.Ing) from Rheinisch Westfalich Technise, Huchshule Achen – Germany. As one of the TIRA founder, he has served as the Commissioner since 1974. Currently he has also been serving as President Commissioner of PT Alpha Austenite since 1977, He was President Commissioner of PT Kayukania Indopermai from 1991 to 2005, the President Commissioner of PT Indovickers Furnitama since 1989, and the Director of PT Martensite Unggul form 1992 to 2013 and as well as President Director of PT Martensite Ungul since 2014. And since 2008 as the Commissioner of PT. Karunia Mandir Sejati/D‘ Agape meeting & conference as well as the President Commissioner of PT Tanah Sumber Makmur since 2008. Shinta Widjaja Kamdani sits as the Chief Executive Officer of Sintesa Group. Shinta is responsible for the Management and Expansion of the Group’s business interests in Indonesia. Sintesa Group is an Indonesian group comprises of 16 subsidiaries, which operate in the Property, Industrial Products, Energy and Consumer Products Distribution. Her leadership in the organization can be reflected as follow: Commissioner of PT. Tira Austenite, Commissioner of PT. Metaepsi Pejebe Power Generation, President Commissioner of PT Blue Gas Indonesia, President Director of PT Puncak Mustika Bersama, President Director of PT. Widjajatunggal Sejahtera, Commissioner of PT. Tigaraksa Satria, Tbk, Director of PT. Menara Peninsula and President Director of PT. Menara Duta. Shinta has been actively engaged in numerous business and social organizations in Indonesia notably as Vice Chairwoman of the Indonesian Chamber of Commerce and Industry (KADIN), as Deputy Chairwoman of the Employers’ Association of Indonesia (APINDO), President of Indonesia Business Council for Sustainable Development (IBCSD), and as International Board Member of World Wide Fund For Nature (WWF) International. Soebronto Laras graduated from Paisley College for Technology, Scotland major in machine engineering in 1969 and in 1972 from Hendon College for Business Management London. After finishing his study, this gentlemen who likes sport started his carreer in Indonesia. In 1973 he was the Director of PT First Chemical Industry that sells formica, plastic wares, and calculator assembling. 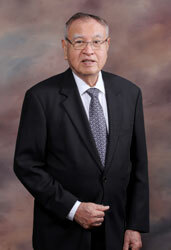 In 1976 – 2008 he was the President Director of PT Indomobil Utama and in 1990 renamed PT Indomobil Suzuki International. And now besides serving as President Commissioner of PT Indomobil Sukses International Tbk since 2002, and PT Nissan Motor Distributor Indonesia since 2001, and as Vice President Commissioner at PT Jurnalindo Aksara Grafika (Bisnis Indonesia) since 2006, he also served as Commissioner in many companies. In 2011 he was the Commissioner of PT Tira Austenite Tbk. Other than that he is also known active in several organizations such as KADIN advisor, Board of Advisor of ASEAN Business Advisory Council, Head of APINDO, Member of Dewan Yayasan Perguruan Cikini and Yayasan AIDS, and he is also the founder and the Supervisory Board of GAIKINDO and AISI. Selo Winardi, graduated and titled as Accountant from State Accounting College in 1985, and achieved title as Master of Business Administration (MBA) from Institute of Education and Management Development (IPPM) in Jakarta in 1991. Mr. Selo Winardi also has Certified Accountant (CA) from Indonesia’s Accountant Association (IAI) and Certified Professional Management Accountant (CPMA) from Indonesia’s Management Accountant Association (IAMI). Selo Winardi occupied position as Company Director since 11 December 2008. Before joining the company, he was once working as Auditor at the Directorate General of State Finance Supervisory (DJKPN) of the Ministry of Finance of Republic of Indonesia and Senior Auditor at the Supervisory Board of Financial and Development (BPKP), Deputy Finance Director in PT Trikora Llyod and also as Finance and Administration Director in PT Danapaints Indonesia. Selo Winardi has joined PT Tira Austenite Tbk since 2003 as Head of Corporate Internal Auditor, General Manager of PT Mitra Guna Gas and Director of PT Multi Guna Gas (both companies are subsidiaries of PT Tira Austenite Tbk), before serving as Director, he served as Vice President of Industrial Gases. Currently, Selo Winardi is also participate a number of organizations such as: President Commissioner of PT. Hamana Works Tira Indonesia, Vice President Industrial Division in Sintesa Group, National Leadership Council of Indonesia’s Entrepreneurs Association (APINDO) as Deputy Chief of America and Europe Division since 2013, Board of Indonesia’s Management Accountant Association (IAMI) as Member of Supervisory Board, Member of Indonesia’s Industrial Gas Association (AGII) and Indonesia Service Dialogue (ISD) as Member of Board Founders and Member of Board of Directors. Agus Hasan Sulistiono Reksoprodjo also known as Yono Reksoprodjo, graduated as a Naval Architect from the Mechanical Engineering Department, Faculty of Engineering, University of Indonesia in 1987. He continued his higher degree to become Doctor of Philosophy in Computer Aided System Engineering majoring in Reverse Engineering Technology from Imperial College, University of London, United Kingdom (UK) in 1994. Within his professional life, Yono had gained experiences starting from engineering design works to higher level in general management at world’s class industries such as the Indonesia Aerospace (IPTN/PTDI) in Bandung, Rolls Royce Aero Engine in UK, Rover Plc in UK, Milliard Design in Australia, Shinwa Engineering International and ARACO in Japan. His other activities cover academic roles as lecturer at many prestigious universities in and out the country and as special advisor to Governmental institutions mostly related to Defense and Security. Yono is active at the Institution of Engineers Indonesia (PII) and the Chamber of Commerce and Industry Indonesia (KADIN). Yono involves in humanitarian activities through Global Rescue Network and once seated as Professional Steering Committee member of the National Agency for Disaster Management (BNPB) in 2009–2014. His interest in ICT and asymmetric strategy studies brought him to be the advisor of the Commander in Chief of the Indonesia Defense Forces (TNI) for C4ISR in 2006-2013. In 2011, Yono was invited to join a Visiting Fellowship Program on National Security by the Department of Defense Australia and stay as guess lecturer at Canberra University and Australia National University. Yono was a member of the BOC of PT. TIRA Austenite, Tbk in 2003-2010. Today, DR Yono Reksoprodjo seats as the Vice President of Corporate Affairs of Sintesa Group as well as lecturer at Indonesia Defense University (UNHAN). Soeseno Adi got his Master of Management degree from University of Indonesia in Jakarta 2002,where previously he has Bachelor of Economics in Accounting from Gadjah Mada University in Yogyakarta. He earned certification Professional Certified Management Accountant ( CPMA ) in 2013. He began his career in PT Tira Austenite Tbk as General Manager for Finance and Accounting in 2010 to become Vice President for Finance and Administration in 2014. Prior to joining the company he has worked as a Financial Analyst at PT Nestle Indonesia , Cost Controller at Total E & P Indonesie , Field Accountant at Schlumberger Oilfield Services , Division Head of Finance , Accounting and Supporting Multi Structure Group and General Manager for Finance and Accounting in Surya Semesta Internusa Group.